Saturday Night Live has been reflecting and influencing the American Story for 40 years. Live From New York! explores the show's early years, an experiment from a young Lorne Michaels and his cast of unknowns, and follows its evolution into a comedy institution. 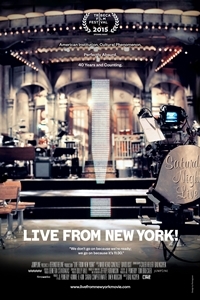 The film looks at SNL as a living time capsule, encompassing decades of American politics, media, tragedy, and popular culture with an irreverent edge. Archival footage is interwoven with stolen moments and exclusive commentary from SNL legends, journalists, hosts, musical guests, crew and others influenced by the comedy giant. Live From New York! captures what has enabled SNL to continually refresh itself over nearly 800 episodes and keep America laughing for 40 years.